The most creativity you’re likely to see in a typical clothing store display is a funky combination of animal patterns and plaids. The employees of one PUMA store decided to get a little more inventive with their Ferrari-branded clothing, though. 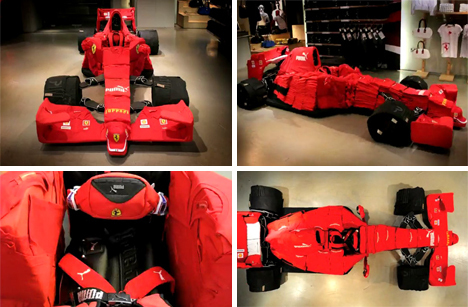 In one afternoon, they built an entire Ferrari Formula 1 car sculpture using nothing more than their stock of Ferrari shirts, caps, bags and shoes. The car includes awesome details, like a seat belt and a fanny-pack steering wheel. The process looks simple in the time-lapse video, but it was surely quite complicated. Does anyone else have the urge to dive onto it like a giant pillow? I’m sure it wouldn’t be appreciated by the staff who spent their entire afternoon constructing it, but it would definitely be fun. See more in Cars & Trucks or under Transportation. October, 2009.